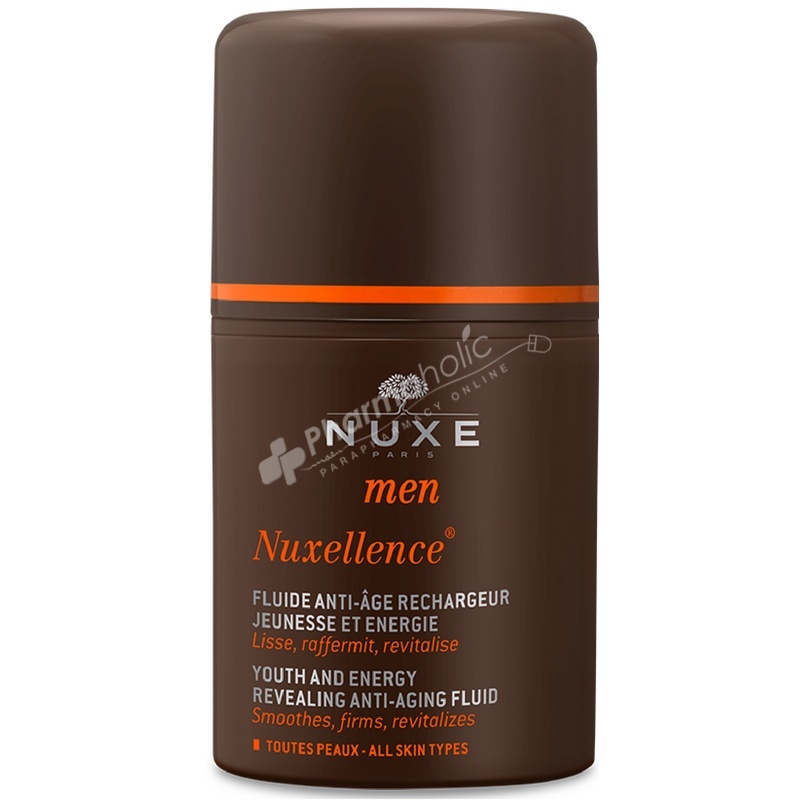 Nuxe Men Nuxellence Youth and Energy Revealing Anti-Aging Fluid 50ml is a new generation care that allows to fight against signs of aging by men. This care contains 90,2% of ingredients from natural origin. Nuxe Men Nuxellence Youth and Energy Revealing Anti-Aging Fluid is a new generation care that allows to fight against signs of aging by men. This care contains 90,2% of ingredients from natural origin such as oak extracts, hornbeam buds, passionflower, anchuse, araucaria seeds, hyaluronic acid. Day after day the skin appears younger, firmer and is revitalized. The wrinkles are clearly less visible and the complexion is not dull. Apply every day on the clean and dry skin (morning and/or evening), after shaving. Aqua (Water), Macadamia Integrifolia Seed Oil, Glycerin, Dimethicone, Hydroxyethyl Carbonate, Capryloyl Glycine, Parfum (Fragrance), Silica, Butylene Glycol, Sodium Stearoyl Glutamate, Dimethicone Crosspolymer, Tocopherol, Carbomer, Citric Acid, Sodium Hyaluronate, Sodium Hydroxide, Ethylhexylglycerin, Dehydroacetic Acid, Allantoin, Phenoxyethanol, Sodium Gluconate, Polysorbate 60, Sorbitan Isostearate, Ammonium Lactate, Alcohol, Passiflora Incarnata Extract, Papaver Rhoeas Petal Extract, Benzyl Alcohol, Ascorbyl Glucoside, Olea Europaea (Olive) Leaf Extract, Zinc PCA, Methylglucoside Phosphate, Anchusa Arvensis Extract, Copper Lysinate/Prolinate, Plankton Extract, Ascorbic Acid, Araucaria Angustifolia Seed Extract, Carpinus Betulus Bud Extract, Quercus Robur Bark Extract, Limonene.